Who were the celebrities that I most wanted to emulate? It was Whitney Houston & Madonna! I wanted the grace, beauty & elegance that Ms. Houston possessed mixed with the raunchy sexiness that still is Madonna. Right before I hit that teenage rebellion stage, I was curious about how I could best tap into my femininity. These ladies helped me delve deeper into my feminine side. I feel like a part of my childhood is gone. Even though I know that Whitney Houston had become drug-ravaged over the years, I always hoped that she could turn it around & make a comeback. Unfortunately, the death of Whitney Houston means that her career will be revived. People will buy her songs now that she is gone. We won’t be able to witness a Whitney that is alive & well singing spectacularly on stage in front of the world. The voice that wrenched so many hearts & souls will be doing that only through recordings now. What a crying shame! Rest in peace, Whitney! You will always be the ultimate super-diva. 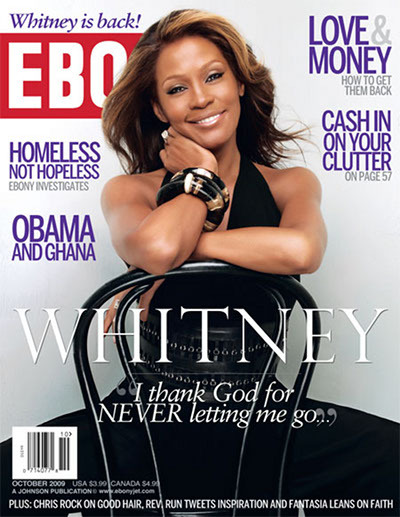 “Whitney Houston, who found fame as one of pop’s biggest voices, has died. She was 48. Houston died Saturday afternoon, a representative for the singer told the Associated Press. Houston’s death comes on the eve of the Grammys and on the night of Clive Davis’ annual pre-Grammy gala, at which she performed last year and was expected to attend this year. No cause of death has been announced and law enforcement sources said the singer was found in a hotel room at the Beverly Hilton, where emergency medical personnel were called sometime Saturday. The Hilton is the scene for Davis’ annual gala. On Thursday, Houston dropped by the rehearsals to offer vocal tips for Brandy and Monica, who were slated to be one of the evening’s headliners. Press, including The Times, were in attendance for a junket with the reunited R&B divas and Davis. Though Houston greeted people her with a warm smile, she appeared disheveled in mismatched clothes and hair that was dripping wet with either sweat or water. The visibly bloated singer displayed erratic behavior throughout the afternoon — flailing her hands frenetically as she spoke to Brandy and Monica, skipping around the ballroom in a child-like fashion and wandering aimlessly about the lobby. It was mentioned by a Grammy staffer that security personnel received calls of the singer doing handstands by the pool. After leaving rehearsals, Houston returned to the ballroom — with her teenage daughter Bobbi Kristina in tow — as camera crews set up for interviews. The singer smelled of alcohol and cigarettes. A Grammy staffer said that during the interviews with Brandy, Monica and Clive, Houston was dancing just off camera to make the singers and Davis laugh. Grammy personnel expressed concern that she’d be caught on camera, and that reporters would write about her behavior. “She really loves and supports us both. For me, I went through a lot of very tumultuous moments and she would show up, not just with a phone call but physically when I needed,” Monica said when we asked about Houston coaching them. “That’s something that I’ve carried with me, especially with all that she’s been going through over the years herself. She’s never turned her back on the people she cared about.”(End of Excerpt) Read more here.